G. Thomas Couser’s work on disability life narratives in “Signifying Bodies” highlights the “devaluation” and “stigmatization” of disabled people that are promoted and reinforced as a result of a set of rhetorics (32). His work challenges common disability narratives and leads me to re-evaluate disability life narratives with which I am already familiar, and to ask questions about the impact that common rhetorics have on people with disabilities. Being Canadian, the first example of a disability life narrative that comes to my mind is Terry Fox – the man who, after losing a leg to cancer, set out to run across the country in order to raise money and awareness in a project he named the Marathon of Hope. 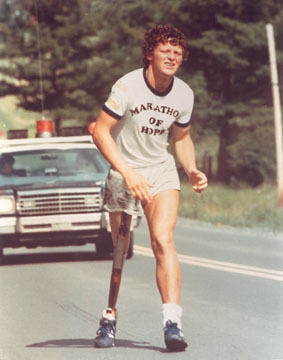 In my opinion, under Couser’s classification of rhetorics, Terry Fox’s Marathon of Hope both follows and counters the rhetoric of “triumph over adversity” (33). Terry Fox, on his Marathon of Hope. He follows the rhetoric in that one would not expect a man with one leg to attempt to run across the country. By doing so, Terry Fox “removes [himself] from the category of the disabled” (34). Couser insists that stories like Terry Fox’s paint the image of the “ideal” disabled person, thus misrepresenting the majority of the disabled population in order to satisfy the audience’s desire to feel inspired. On September 1st, 1980, Terry Fox succumbs to his cancer and is forced to quit his Marathon of Hope. He does not quite overcome his disability as one would in the typical rhetoric; however, his legacy is ultimately not in his death but in his life, and most stories about him will emphasize this in order to fit the rhetoric. Gabriel Parker-Haines, a young cancer survivor. 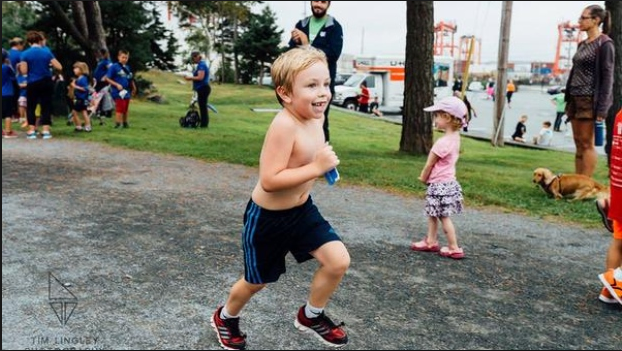 How has Terry Fox’s story had an impact on the rest of the disabled population? His rise to fame has certainly inspired yet more disability life narratives, ones which promote the rhetoric of triumph over adversity even more. For instance, the stories of Gabriel Parker-Haines and Heather Farthing follow cancer survivors following in Fox’s footsteps—almost literally—on runs of their own. Now, looking at the stories which rise to fame, I question which ones do not. The majority of the disabled population remains unrepresented—stories which fit no typical paradigm and as a result receive no attention, even though they are neither less important nor are they any less real than that of Terry Fox. Hi Zoey, I really enjoyed your blog. I liked the introduction (informs the reader on what is going to be talked about). Also through your use of a familiar disabled man, you were able to give a detailed point of view on your perspective on disability.